Interested in bikepacking? 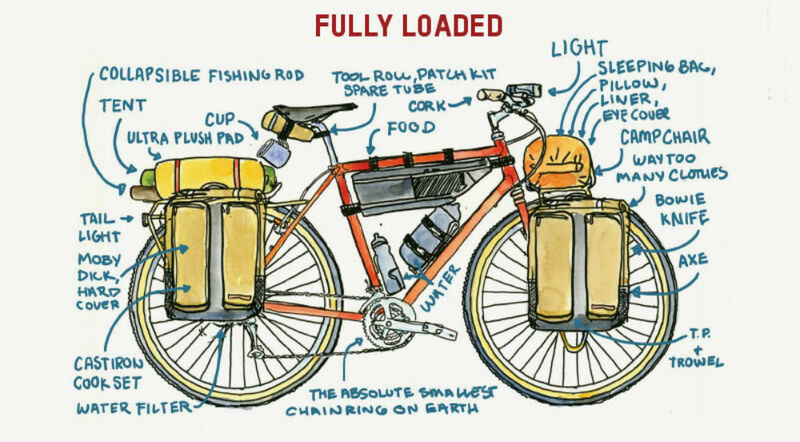 This illustrated guide gives a helpful (and humorous) look at how to load up your ride for a weekend away on the road or the trail. Flip-flops, hair dryer, sporks, and “way too many clothes.” No matter what you’re packing, the folks behind Roll With It, a bikepacking film and companion book, want to help you learn the ropes. The project was launched this summer by Blackburn, maker of cycling accessories like bike racks, panniers, frame bags, and everything else made to outfit bikes for long treks. The four illustrations below by Chris McNally are light-hearted but offer great detail on what and how to pack for different excursions. The Credit Card setup is for day-trippers taking on only moderate miles. Plan to have someone put you up overnight because this is a minimalist’s rig, no room for a tent. 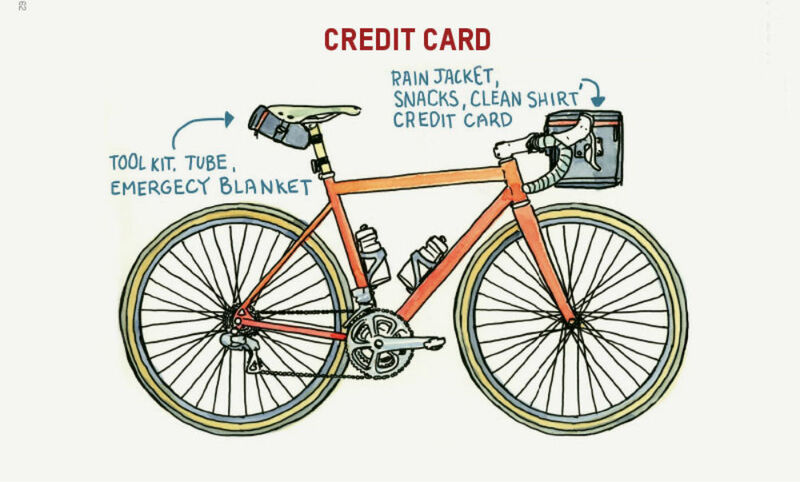 An emergency kit, a couple water bottles, and whatever you can fit in a handlebar bag (think: light rain jacket, toothpaste, phone, charger, and all the trail mix you can stomach). The Mix & Match design is for riders with their eyes on the horizon. Your bike should be able to handle tarmac, bumps, gravel, and some mild off-road. Load your tent, dinner, extra water, and anything else heavy in the frame bag. 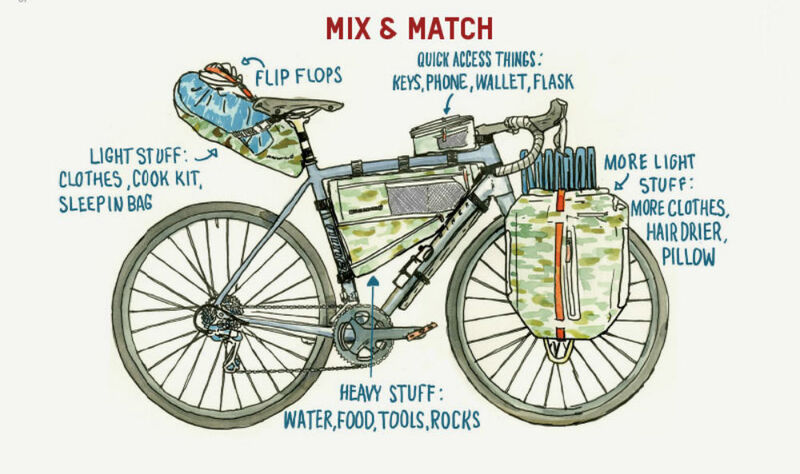 Toss a pannier on the front (front-loading is better than back for touring rides) with some of the lighter stuff you’ll need for camping. The addition of a seat pack and top-tube bag for all other essentials (and munchies) should give you just enough carriage for a self-supported trip. If you decide to go full-on gnar, the Bikepacking Rig may be your best bet. This one is for riders who plan to leave the road behind, favoring rugged terrain over long miles. 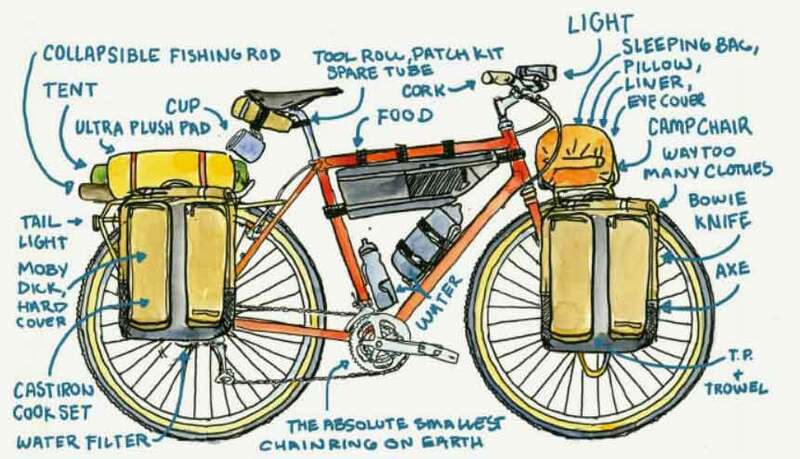 It’s similar to the Mix & Match, minus the pannier (you’ll need that suspension). Toss in a stuff sack and handlebar roll to make room for your stuff while leaving your bike as nimble as possible. At some point in your bike-packing evolution, you will want to really test your mettle (and your ride’s). When you reach that point, the Full Loaded setup is what you will want. Panniers on front and rear, frame bags, racks, and basically any other cargo you can strap down to the bike will leave you room for anything you’ll need to pack for long trips far, far away. Plan to bring plenty of food for breakfast, lunch, and dinner, cooking supplies, toiletries, shelter, clothes for warm, cold, wet, and dry, and perhaps a calendar so you’ll know what day it is. –The full “Roll With It” bikepacking film and book are available on Blackburn’s website for $20. 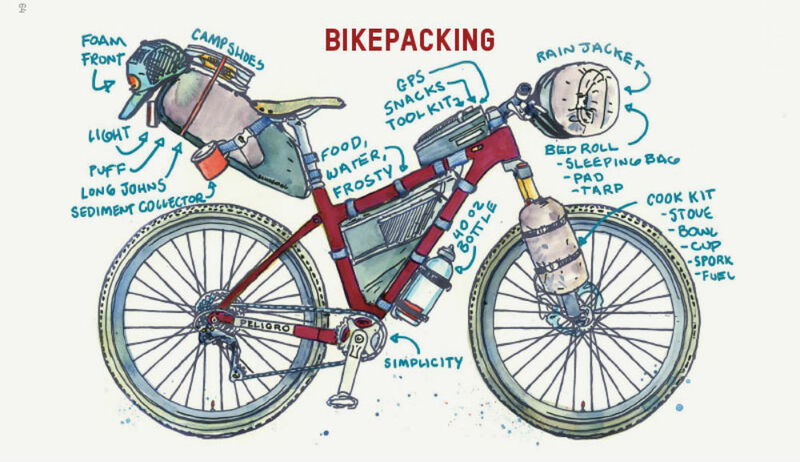 The post Bikepacking Made Easy: An Illustrated How-To appeared first on GearJunkie.